If you're looking for a healthier alternative to your classic chocolate cookies recipe, I think you found it. 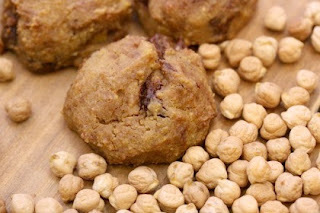 While I do enjoy eating garbanzo beans, I'm not sure if I would like them in a cookie or brownie recipe. With that said, I was asked to share this recipe with all of my foodie blog readers. If you make the recipe, let me know what you thought of them. The recipe is courtesy of Chef, Anthony Stewart, Executive Chef at Pritikin Longevity Center + Spa. They are definitely different! In a food processor puree Garbanzo, apple puree, vanilla and ½ cup Splenda and blend until smooth. Combine melted chocolate with 1 cup Splenda and add to mixture. Continue to blend until well incorporated. (if using cocoa powder- combine cocoa powder with Splenda and just enough warm water to make into a thick paste then add to mixture). Add egg white and mix for another two minutes. (for cooking, whip egg white until fluffy before adding). For cookie, spoon onto a lightly greased cookie sheet or grease paper lined. For brownie, line a small square cookie tray and scoop mixture spreading evenly. Bake at 350 degree for 25 minute or until the edge begins to leave side of tray. Cool and cut into 3x3 inch squares. Drizzle with vanilla sauce and serve. I am not sure about this recipe, but am quite willing to try it when the weather is a little cooler. It certainly cuts down on the fat and sugar content which would be great for my diabetic husband.